Freshly painted stairs and risers are a great way to add to the look of your home. You can give your home a classic look with dark stained stairs with bright white risers and matching dark stained bannisters. You can do something different using varied colours and designs. Stairs, risers, bannisters and stringers can all come together to create a beautiful view between the levels of your home. The options are endless and the result gives your home personality. Painting stairs and risers is a complicated job. It takes precision and care to paint stairs and risers. When done without experience the result can be very unattractive as accuracy is required for fine lines and edges. 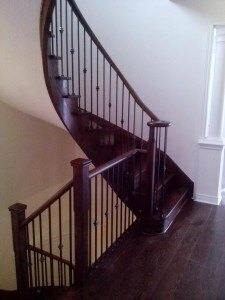 Using a professional painting company will save you time and energy leaving you with picture perfect stairs and risers with crisp lines. Save yourself the hassle and call Platinum Pro Painters today.